There are many things that make the octopus a strange creature, but one of them is that each of its eight arms has an essentially infinite number of positions, and yet each arm operates independently. How does an octopus keep from tying itself in knots? 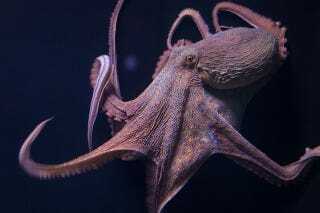 A group of Israeli and American researchers think they've discovered how the octopus keeps its arms in order. The problem is that octopus arms behave as if they have a "mind of their own." One way that octopuses simplify their lives is by using highly stereotypical motion patterns to reduce the infinite nature of their motion possibilities. Still, "the hundreds of suckers along each arm have a tendency to stick to almost any object they contact," according to the researchers. "The existence of this reflex could pose significant problems with unplanned interactions between the arms if not appropriately managed." How can an octopus's arms simultaneously operate so reflexively while also remaining cohesive enough to avoid problems? The researchers, led by Hebrew University neurobiologist Nir Nesher, got their first clue when they noticed that the suckers on amputated octopus arms never attached onto the arm itself or onto another amputated octopus arm. It was as if the arms – which, devoid of the rest of the octopus's body, are limited to simple reflexes – were actually avoiding making contact with other octopus arms. A more carefully controlled experiment revealed that twenty-one amputated arms never grasped other amputated arms, but they had no problem grasping amputated arms with the skin removed. A single octopus arm is a biological marvel, a sensory organ containing some 40 million tactile and chemical receptors, concentrated especially along the rims of each sucker. Nesher and his colleagues suspected that there was something in octopus skin, perhaps a tactile or chemical signal, that deters octopus suckers from latching on. To see just what it was about the skin that repelled those suckers, the researchers compared the amputated arms' responses to Petri dishes coated in an octopus skin extract or a fish skin extract. To measure the sucking reflex, they measured how much force was required to separate the amputated arm from the Petri dish. The amputated arms held on to the octopus extract dishes twenty times more weakly than the fish extract ones, verifying that there is a chemical signal in octopus skin that octopus suckers can detect, which then inhibits grasping. Next, Nesher turned to living octopuses. He presented them either with their own amputated arms or with the amputated arms of other octopuses, as if they were food items. That's not as macabre as it sounds; Octopus vulgaris, the common octopus, is known to be cannibalistic. While the amputated arms rejected all other amputated arms, the living octopuses responses were mixed. In some cases, they displayed the typical "prey capture" behavior. But in other cases they avoided the amputated arms entirely, occasionally showing a "behavior uncharacteristic of feeding," in which the octopus brought the arm to its mouth but simply held onto it, dangling from its beak, untouched by the octopus's own arms. Nesher calls this "spaghetti holding." When the data were examined closely, the differences in behavior came clear. The octopuses could distinguish between the amputated arms of other octopuses and their own amputated arms! They were significantly more likely to treat an arm belonging to a different octopus as if it was food. Together, the results show that not only is there a generalized reflex within the octopus arms themselves that resists grasping onto octopus skin, but that the octopus's central brain can override that reflex. In other words, the arms themselves always vote not to grasp octopus skin, but higher circuits within the octopus's nervous system can veto those votes. The octopus's brain would very quickly become overwhelmed if it had to maintain a mental representation of each arm's location in space. So the arms themselves have their own process through which they avoid getting themselves tangled. But sometimes the octopus needs to modulate that rigid process, which it can do thanks to more complex top-down brain circuits, and possibly even cognitive mechanisms. That helps to explain the awkward "spaghetti holding" behavior that Nesher witnessed. The beak, after all, "is the only organ that allows holding when the suckers' action is inhibited," he says. Does this mean that octopuses are particularly sophisticated, that they have self-recognition? Perhaps not. While octopuses are undoubtedly sophisticated creatures, what this research reveals is that apparently complex behaviors can emerge from a set of simpler reflexes. That doesn't mean that cognition itself is an illusion, only that it isn't necessary to describe all forms of self-recognition. The octopus, after all, is a highly specialized, unique animal. "The morphology and flexibility of the octopus body are so unusual that almost every level of their motor system organization, from the higher motor control centers, to the autonomy of the elaborated peripheral nervous system of the arms, down to the neuromuscular system of the arms, have evolved special properties," Nesher says. Nesher thinks that his findings will be useful as engineers continue to innovate in soft-bodied robotics. If a robot has body parts that can easily interfere with one another, it might be more efficient to build an octopus-inspired system for self-avoidance rather than a more conventional top-down, computationally intensive mechanism.